A pirate lives for two things: the warm breeze and salty water blowing on their face as they freely sail the Seven Seas, and gold! Gold pays for all the food, boots, rum, gunpowder, and everything else needed to find more gold. And, if you have never had the experience of cracking opening a treasure chest full of glittering gold doubloons, you don't know what you're missing! Since gold is crazy-expensive and nobody really carries sacks of it around nowadays, you probably won't get to roll around on a pile of riches any time soon. Luckily, if you are just dressing up as a pirate, you don't really need real treasure to pull off the look. 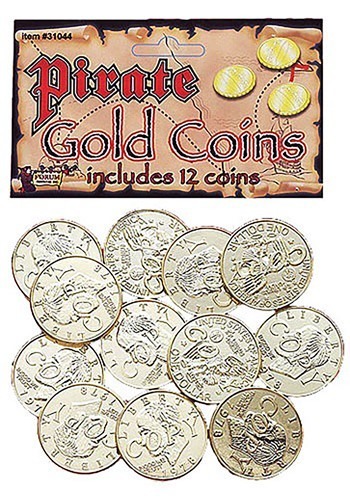 Just stuff some replica Gold Pirate Coins in your pockets, and you'll get a little taste of why pirates spend their lives chasing after the real thing. Who knows, you may even decide to take up the pirating life, and go plunder some gold of your own!